Cloud hosting is a good alternative for those who are not eager to be tied to a single server. The system acts as a virtual server using different sources to pull out the necessary resources to store the site. The core advantage of a cloud solution is that your project will never go down if the server goes down. As a rule, it has a server network to ensure flawless performance whatever happens. Although cloud hosting is a bit more expensive if compared to shared hosting services, it provides a good balance between power and affordability. Users can choose from dozens of offers available on the web. Opting for the right one might look like a great challenge. We have tried out several top providers to save your time and pick the one that is just right for you. 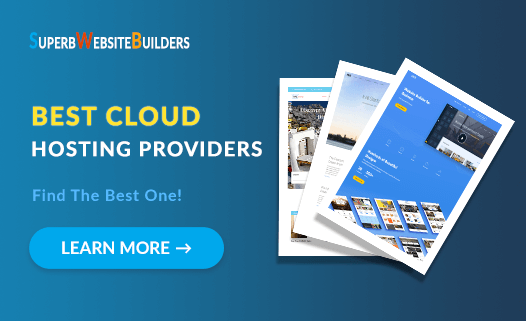 BlueHost comes with affordable cloud-hosting plans for small and medium websites boasting probably the fastest page load speed in the market. Multiple SSD space options let customers choose the best-matching package with enough resources to handle traffic peaks and spikes in addition to a single-click WordPress installation. SiteGround uses innovative technology and various data centers in different parts around the globe to ensure ultra-fast performance. It offers optimized scalable cloud-hosting solutions that are fully managed by dedicated professionals. You can choose a customized server package for various projects despite the size or complexity. Hostinger has some crucial advantages that make it a worthy cloud-hosting solution. It guarantees up to 99.9% of uptime at 3x faster site performance at affordable prices. The system reserves enough room for further growth for those who always loom for extended hosting opportunities. Bandwidth – the amount of bandwidth defines how much info your website can deliver through server connecting as well as its traveling speed. The more bandwidth you have, the better the performance your website will showcase even when the traffic is extremely high. RAM – random-access memory is the digital brain of the cloud hosting. If your website needs to handle multiple processes at the same time, you are supposed to look for enhanced RAM to cover several gigabytes depending on the site functionality. OS – Cloud hosting relies on its operating system. It affects all vital processes and manages virtual server infrastructure. In other words, cloud operating system is the virtual heart that handles executive processes as well as back-end software and hardware resources. The above-mentioned are some baseline aspects. Now we are going to have a closer look at best cloud-hosting offers and features they bring. Performance – the latest tests revealed nearly perfect uptime rate that is up to 99.99%. At the same time, the platform appears to be one of the fastest in the market when it comes to page load speed. The average speed rate is 424ms. Low-Maintenance Service – the system stores data mirrors across various devices. If one of them drops down in case of the trouble, the others will pick up the slack until the error is eliminated. The platform pulls out enough resources to ensure great speed and performance despite the traffic and possible breakdowns. WordPress Credentials – even though we are speaking of cloud hosting, we simply cannot miss the fact Bluehost is the best WP-oriented hosting provider. Customers can benefit from a single-click WP setup in addition to automated upgrades, WP themes, plugins, add-ons, etc. Simple Plan Extension – Bluehost makes it easy to switch between plans every time your project craves for more capabilities. All you need is to ramp up the payment according to a new plan and start using it at once. Bluehost Cloud Hosting Cost: Bluehost has three cloud packages. They include Starter, Performance and Business Pro plans with up to 6GB of RAM and multiple SSD storage options costing $10.99, $15.99 and $29.99 per month respectively. You can take the advantage of extra discounts and save a couple of bucks if pay for 24 or 36 months in advance. Fast and Powerful Platform – Siteground uses latest technologies to ensure server resourcefulness at a high website speed. The system uses Linux containers combined with SSD disks with enough space despite your project needs. Scalability – at some point, your project might need more resources in case of increased traffic or spikes. Siteground makes it easy to gain more power by adding extra resources to your server with just a click. No rebooting is necessary. Round the Clock VIP Support – customers can use several ways to benefit from almost instant support live, on the phone or via email. Ticketing system will take you not more than 10 minutes to get a response. Managed Server and Regular Backups – the platform delivers the actual IT maintenance while managing server infrastructure and configuration software in accordance with customers’ needs. You may not fear of losing any data, as website backups are made on daily basis. Geo Accessibility – Siteground boasts data centers in 4 different locations. It ensures a fast and easy access despite users’ physical location. The solution includes free CDN. SiteGround cloud hosting cost: Siteground cloud hosting plans will hardly put ease on the wallet. The entry package will cost you from $64.00/month with 4GB of memory and 40GB SSD space. The entry plan is followed by Business and Business Plus that cost $96.00 and $128 per month respectively. They can be a good choice for complex eCommerce web projects offering up to 8GB memory and 80GB SSD space. Super Power Plan will cost you $192 per month for the most complex projects that require maximum efficiency and up to 120GB SSD space. Ultimate Speed and Control – Hostinger specialists will take care of the server management and configuration. All you need is to choose a plan and experience the benefits of 3x higher speed. Your visitors will certainly appreciate almost instant page load time. You can also handle the management process through the control panel without being a technical geek. Extension Capabilities – the system reserves much space for growth and extension. You can launch a small project with the entry plan and then move to a more scalable solution with just a click. You can always count on a more powerful package as your project grows bigger. More Speed with Cache Manager – Hostinger has an integrated caching technology that boosts the website speed. It will certainly have a positive effect on your site SEO ranks, customers’ experience and other vital aspects. One-Click Activation – cloud hosting is very easy to asset up and activate. The process does not require special skills. Simply click the button and get online. Manage Your Resources – although Hostinger uses isolated virtual resources, users still have a total control over all instances, limits, etc. in addition to the dedicated IP. Hostinger cloud hosting cost: the platform comes with 3 fast cloud-hosting solutions. They include Startup, Professional and Enterprise packages. All three plans come with unlimited bandwidth and a dedicated IP address. The Startup plan costs $7.95 per month with 40GB of space and up to 3 GB of RAM. The professional plan will cost you $14.95 per month with 80GB of space and up to 8 GB of RAM. The enterprise plan price starts from $27.45 with 120GB of space and up to 12 GB of RAM. Cloud hosting solutions come as a more flexible tool with clear pricing. You always know what you pay for, as you can see the amount of disk space, RAM, bandwidth, etc. At the same time, cloud-hosting providers never use necessary resources within a single server. They are spread among several units to ensure a flawless website operation despite possible breakdowns. Flexibility is the feature that makes cloud-hosting solutions so reliable and at the same time powerful. While starting price can be similar to some of the regular VPS hosting providers, users can benefit from extended resources.